Top Contributors - Daniel Alcorn, Rob Sigler, Laura Ritchie, Kris Porter and Evan Thomas - Your name will be added here if you are a lead editor on this page. 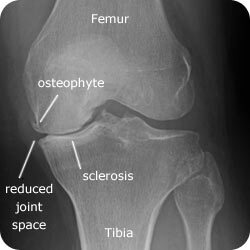 Osteoarthritis (OA) is a multi-factorial condition that is essentially breakdown of hyaline cartilage along articulating joints, and is imaged most often with a radiograph or MRI. Radiographs are the most commonly used source of imaging for knee OA due to their ease of operation, low cost, quick results, and relatively high degree of accuracy. However, an MRI is considered the gold standard for knee OA since articular cartilage is visible and has a much higher resolution of surrounding tissues. There are multiple criteria that are used for OA, but research indicates that these techniques usually have high sensitivity, but at the cost of lower specificity. MCL and LCL tears are classified based on the amount of compartment gapping present with an applied valgus (MCL) or varus (LCL) stress test. Grade I tears present with localized pain along the medial (MCL) or lateral (LCL) knee without significant gapping (0-5 mm). Grade II tears present with significant gapping with a definite endpoint (6-10 mm). Grade III tears (complete) have no defined end point with stress tests (> 10 mm). MCL and LCL tears can be identified with the use of a stress radiograph or MRI (87% diagnostic accuracy). With a suspected ACL tear, diagnostic imaging first begins with plain radiographs. 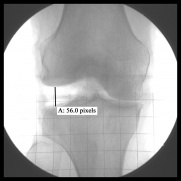 Commonly, a 45 degree knee flexion, weight-bearing postero-anterior radiograph is obtained to rule out associated fractures and gauge the amount of joint space narrowing. 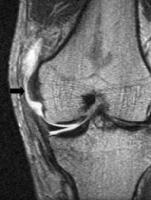 MRI is necessary to diagnose an ACL tear, and is determined using a non-contrast image of the knee. MRI is utilized to identify the presence of a meniscal tear. The MRI is obtained using a proton-density-weighted, high resolution, fast spin echo sequence (to determine the status of both the articular cartilage and the menisci). Newer MRI techniques, including 3-T scanners with cartilage-sensitive pulse sequences and T 2 mapping, allow detection of early degenerative changes in cartilage before discernible loss of cartilage thickness is visible on a conventional MRI. 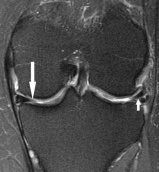 Osteochondral defects (focal areas of articular damage with cartilage damage and injury of the adjacent subchondral bone) are best viewed on MRI.MRI is the test of choice due to its ability to detect the presence of osteochondral fragmentation, which is essential for clinical management. 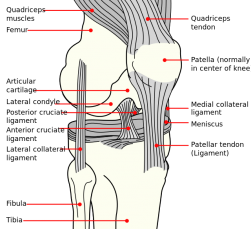 MRI demonstrates high sensitivity (92%) and specificity (90%) in the detection of separation of the osteochondral fragment.Both x-rays and CT are able to detect displaced defects with ease; however they are insensitive in grading lower stage lesions, and are inadequate in predicting stability. Figure 8: (A) Osteochondral defect. 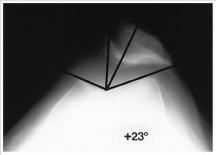 This coronal T1 sequence shows an area of abnormally low T1 signal in the lateral weight-bearing portion of the medial femoral condyle (arrow), characteristic of osteochondral defect. (B) Osteochondral defect. 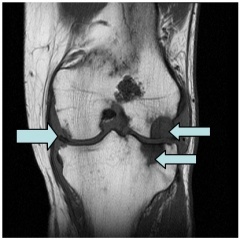 This sagittal T2 sequence with fat saturation shows subchondral irregularity and heterogeneously low T2 signal with adjacent bone marrow edema in the medial femoral condyle (arrow) characteristic of osteochondral defect. Reprinted from Tall et al. Patellar subluxations and dislocations can be viewed from radiographs, CT scans, or MRI. CT scans are only used in cases in which plain radiographs are indeterminate. MRI can be beneficial to highlight bone bruising (usually on the medial aspect of the patella and lateral aspect of the lateral femoral condyle). The most commonly used imaging technique for these diagnoses is radiography, which usually incorporates a lateral view, axilla view and merchant technique. Images are usually obtained within 20-45 degrees of knee flexion because increased knee flexion results in reduction of a subluxated patella. 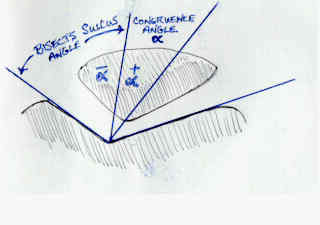 Figure 9: How to calculate congruence angle through the bisection of the sulcus angle. Reprinted from Wheeless CR. ↑ 1.0 1.1 Berry DJ, Stein mann SP. Adult Reconstruction. Philadelphia, PA: Lipinncott Williams Wilkins, a Walters Kluwer business; 2007: 130-139. ↑ 2.0 2.1 2.2 Recht MP, Goodwin DW, Winalski CS, White LM. MRI of articular cartilage: revisiting current status and future directions. AJR. American journal of roentgenology. 2005;185(4):899-914. Available at: http://www.ncbi.nlm.nih.gov/pubmed/16177408. Accessed June 16, 2012. ↑ 3.0 3.1 3.2 Laprade RF, Wijdicks CA. The Management of Injuries to the Medial Side of the Knee. Journal of Orthopaedic Sports Physical Therapy. 2012; 42 (3): 221-233. ↑ Vyas D, Rabuck SJ, Harner CD. Allograft Anterior Cruciate Ligament Reconstruction: Indications, Techniques, and Outcomes. Journal of Orthopaedic Sports Physical Therapy. 2012; 42 (3): 196-207. ↑ 5.0 5.1 5.2 Tall MA, Thompson AK, Greer B, Campbell S. The Pearls and Pitfalls of Magnetic Resonance Imaging of the Lower Extremity. The Journal of Orthopaedic and Sports Physical Therapy. 2011;41(11):873-86. ↑ Noyes FR, Heckmann TP, Barber-Westin SD. Meniscus Repair and Transplantation: A Comprehensive Update. Journal of Orthopaedic Sports Physical Therapy. 2012; 42 (3): 274-290. ↑ 7.0 7.1 Weerakkody Y, Gaillard F. Osteochondral Defect. Radiopaedia Web site. http://radiopaedia.org/articles/osteochondral-defect. Accessed June 25, 2012. ↑ 8.0 8.1 8.2 8.3 Wheeless CR. Subluxation/Dislocation of the Patella. Duke Orthopaedics presents Wheeless’ Textbook of Orthopaedics Web site. http://www.wheelessonline.com/ortho/subluxation_dislocation_of_the_patella. Accessed June 26, 2012.